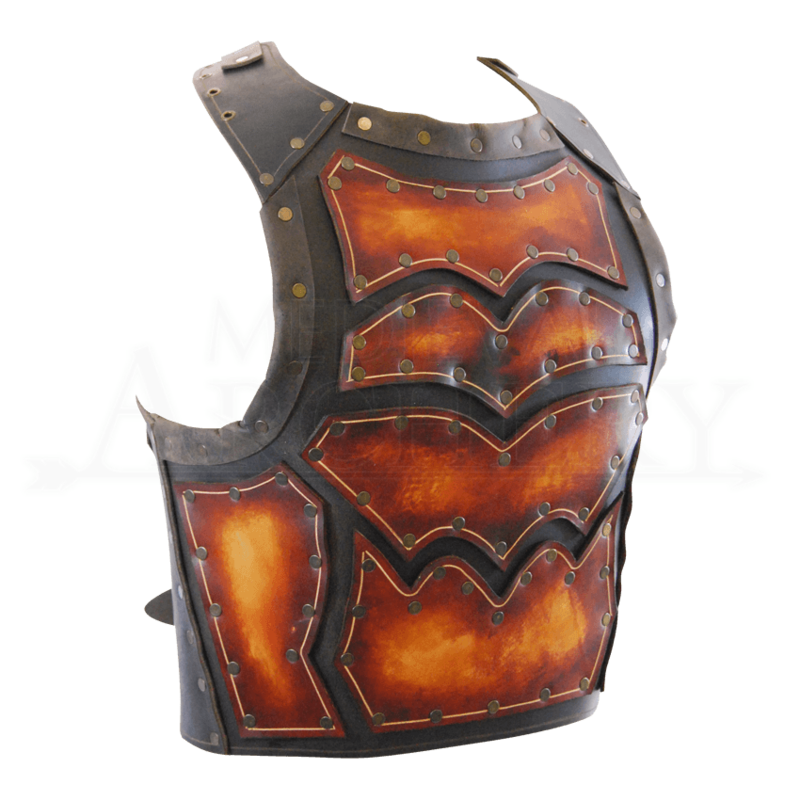 Warriors seeking a distinctive and colorful look might consider this Briar Breastplate. Unlike its metal counterparts, this breastplate is lightweight and maneuverable, and it has a rich look that puts many metal armors to shame. Of course, looks are not everything, and that is why this armor has everything that counts in a breastplate. It is handcrafted from high quality 9-10 oz. leather and consists of a simple leather baseplate that has been adorned with several additional leather plates. Far from just decorative, these impressively hued plates provide an added level of strength and durability that help to transform this armor from decorative to functional. The armor is available in four sizes, and, as the armor is worn using a quartet of adjustable leather straps with two around the lower back and one over each shoulder, the armor has a bit of give that ensures it is highly adjustable. For this reason, you should order your armor according to the measurements that fit you best and then adjust it to comfort once you put it on. The armor also comes in two different colors, featuring either brown backing with a tan plating, or a black backing with a rich cordovan plating. Both color variations are striking and are sure to catch the eye of everyone who glances your way. Combining style and protection, the Briar Breastplate is a great piece of armor to wear to any LARP, fair, or convention where you are looking to not only grab some attention but also show your medieval warrior style.